Place all of the ingredients into a small jar and shake until thoroughly combined. Microwave package of Green Giant Rice Broccoli on high for 3 minutes. Remove from microwave and allow to cool. Meanwhile, shred the carrots, jicama and onion on the large grate side of a box grater. Peel oranges and separate into segments; cut segments into bite sized pieces. 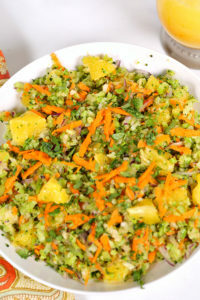 Place broccoli, carrots, jicama, onion, oranges and cilantro into a bowl; Toss until combined. Pour vinaigrette over salad, toss until salad is completely coated in the dressing. If you can find jicama, you can substitute a Red Delicious apple in its place.